Farm Business was acquired by Lewis Business Media in early June 2016 as part of its purchase of a number of assets from Grove House, part of Zinc Media. After an intensive review of the market and the title’s role in it, LBM decided to change the method of its format and distribution to better fit the needs and requirements of its unique audience and advertisers. Farm Business is focussed on supplying information and analysis for progressive farmers. 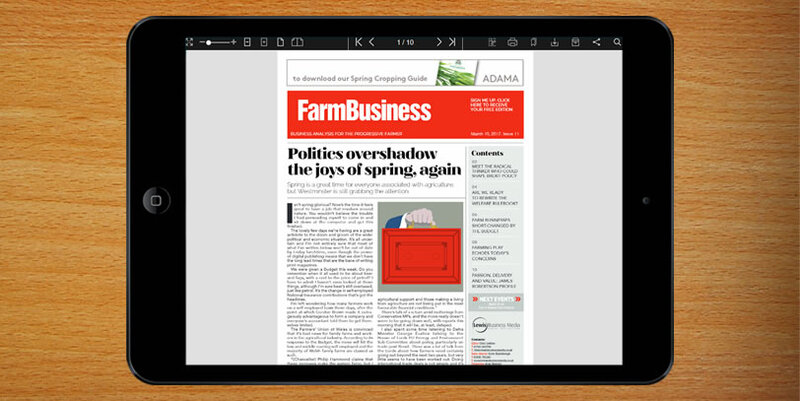 That is why we decided to move to a fortnightly digital edition supplied by email, to be read onscreen, providing timely industry leading analysis and comment which will lead thought in the farming industry. The Farm Business package includes a revamped news website, with a blog offering fast comments on the news, as well as a twice-weekly news update by email to give a heads up on developing issues. Our target farmers, who are already familiar with Farm Business the print magazine, are younger than the industry average, with many in their 40s. They are familiar with technology and are not fazed by the idea of reading our publication on screen. They are already getting most of their information that way. They want us to take a broader view. They want to understand political developments and how they are likely to affect the industry. They want thought provoking writing on how policy will affect them and how the market for their products will develop. They are managing their businesses to make money. They are not waiting for politicians to make their businesses viable for them. They are the decision makers who drive the industry and they are the people our advertisers need to reach. Our advertisers are those selling inputs to the farming industry. They need to reach the individuals who make purchasing decisions. Their products are inputs, for example seeds, chemicals, fertilisers, machinery or, in the case of advice services, know-how. Recent political developments, however they work out in the longer term, must press home to everyone in agriculture that farming based on subsidy is not a viable business option. You cannot run a business dependent on the whims of politicians and an electorate which can be relied on to be unsympathetic to what you’re doing.